Yes, they are actors and sons of a popular producer. 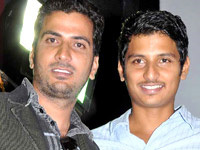 Apparently yearning to achieve more in cinema, Jeeva and 'Jithan' Ramesh are now turning into producers by floating their own production company. Remember we had reported to you about Jeevaâ€™s tweet to fans and friends asking them about their opinion on 'Spiral Dreams'? Look's like its coming into action pretty soon. "We have discussed the idea with dad (R B Chowdary) and he has given his consent. With his blessings, we will soon be floating a new production house which will make our kind of films," says Jeeva. The actor adds: "It is a longtime wish of mine to produce films. And when I found that Ramesh too is toying with the same idea, we immediately decided to join hands. Our family is very supportive of our decision." Elaborating, Jeeva says, "We will initially start producing ad films and experimental movies. Later we will venture into making commercial flicks. And no, we are certainly not a competition to Super Good Movies." A sequel to VTV - STR and Gautham team up again! Maatran on hold, thanks to Karthi! Quick Random Post: Nakka Mukka! Deepika, original choice for 'Rana'? Will 'Badrinath' click well in K'Town? The countdown begins for 7am Arivu music! Venghai's track list is out! Rajini to shoot for 'Rana' from Sept.
Prabhu Deva to convert to Christianity? The news stuff on my website is from other Websites which I definitely will give credit to. I do not own the pictures either, except some. The videos and music gadgets are also from other websites. Some reviews might be written by friends too.